The Orr rolls along north of the Truckee’s stream and terminates finally in far Spanish Springs. 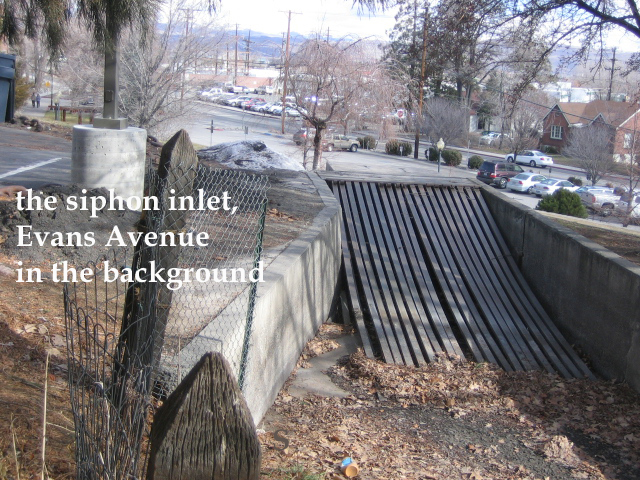 In the days pre-University of Nevada (the University was established in Reno in 1887, after the Orr’s construction) the Orr crossed Virginia Street and then flowed across the campus, west-to-east, crossing a low point in the campus east of Virginia.1 A flume carried the water across that gully until Mother Earth again rose to meet the flume, and the ditch then flowed eastward, then, following the terrain, turned to the north and went well into the (non-existent) campus. Turning to the east, it then was routed south, forming a big “U” and finally turning to cross future Evans Avenue, just at the top of the hill east of the present Fleischmann Agriculture Building. Clear as Mud? So there we were – a developing university with a ditch, by some measurement almost a half a mile in length, curling through the place, mostly to the east of the campus in 1950. A ditch whose path and grade had to be protected, and accessible to the Orr Ditch Company folks. The ditch basically whacked out most of the developable land on the campus. A solution for freeing up the land on campus held hostage by the Orr was available – but – to employ the solution, some decisions had to be made. The ditch had to be moved. Some genius, and I always thought it might have been Ed Pine, came up with the notion of creating an inverted siphon from a point near Manzanita Lake, straight down, then horizontally eastward underground for a distance of about 600 feet, then daylighting on the east side of Evans Avenue and returning to its 100-year-old path. No pumping was necessary; the weight of the water entering from the west (high) end of the siphon would push the water to grade at the east terminus across Evans Avenue. Documenting this has been dicey – I’ve tried in years past, and on recent trips about the village where records are stored, mostly the Nevada Historical Society. What’s of interest is, when exactly did the regents and the ditch company finalize the idea, and who were the engineers and contractors who did the actually work (it’s a concrete structure)? the June and August 1958 minutes of the Board of Regents meetings mark it as a fait accompli; the decision to go ahead with the siphon had been made by then and had the Orr Ditch Water Company’s blessing. The biggest issues at those meetings were the maintenance of the entry (west) end, keeping the screens clear to sustain the flow of water, a requirement of the ditch company (the university was footing the bill for the siphon), and, keeping the screens intact to prevent the entry of people and pets into the pipe for what would surely be an E-ticket ride across Evans Avenue (the ditch moved right along; as residents of the Whitaker Park area we kiddies rode it occasionally in an inner-tube2, a fact I couldn’t reveal until both my parents were pronounced dead, as there was no statute of limitations on ditch-related matters.) On a serious note, I lost about six friends to the ditches – the Orr and the Cochran. Jackie Sundstrand of the University’s Special Collections wrote an excellent story of the ditch tragedies and the civic efforts to fence them, in the Summer 2004 Nevada Historical Society Quarterly magazine. But who built the siphon? I don’t know – it looked to me like a job for Isbell Construction, a natural as Ed Pine Sr. had ties to both the U and Isbell – as the Buildings & Grounds Director and later Vice President of the university, and, as one-time President and CEO of mighty Isbell. But I don’t know that. Yet. Help. Whoever did it – and I can remember the construction effort as a high-schooler riding my bike around campus – it was done by the time that the Aggie Building opened when I started my tortuous UN matriculation in 1959. (Reader Mischa Miller’s uncle worked for Isbell, said nope, Isbell didn’t do it, so who knows…? Now, entering the field of romance, as I so often do and do so well, I should point out many a U of Nevada swain chose the “Tram” of the Orr Ditch’s crossing of Manzanita Lake to propose to his comely coed and slip the ring on her quivering finger – I wrote this once waxing sentimental in the RGJ on a Saturday morning, and received a dozen notes from folks who proposed, or were proposed to, on the Tram. Recently while hanging around the Sigma Nu house where I go occasionally to offer some alumni help, I asked some of our assembled active Snakes if this is still the custom. Welcome to the travails of geezers writing in the 21st Century!